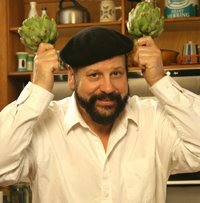 The Hippy Gourmet has more interesting food policy coverage than your typical TV cooking show. And not every TV cooking show's website offers as many as six links for viewers who are following current events and want to join the peace movement. U.S. Food Policy stays away from such divisive and off-topic controversies. I'm just reporting that the silly hippy linked to these sites. The Food Safety and Nutrition Section, in collaboration with the International Section, hosted a fascinating panel on food aid at the annual meeting of the American Agricultural Economics Association last week. My Friedman School colleague Patrick Webb described the increasing professionalism of the food aid community, and the increasing importance of emergency food to alleviate crises, in place of food aid as a form of agricultural dumping. Other participants included Terri Raney from the Food and Agriculture Organization, Chris Barrett from Cornell, and Linda Young from Montana State. Barrett's book with Dan Maxwell last year raised many of the critical problems with U.S. food aid programs. Even while acknowledging those problems, Young makes an eloquent argument against using the World Trade Organization (WTO) as a way of "disciplining" food aid to solve them (see this .pdf file for some of her themes). As she tells it, the WTO shows symptoms of being more interested in protecting export markets for rich countries than it really is in protecting farmers in poor countries from dumping. In some of the lively back and forth discussion, Barrett and Young both seemed to agree on the need for some sort of trade discipline to make sure countries don't return to their old practices of using food aid for surplus disposal rather than humanitarian purposes. At the same time, they both appeared to recommend some method other than the WTO, such as perhaps an expanded version of the Food Aid Convention, to impose the necessary disciplines. Who does the U.S. trade delegation represent when it refuses to budge on farm subsidies and market access? Certainly not American taxpayers or consumers. Farm subsidies cost taxpayers about $19 billion last year. For their money, consumers got the privilege of paying more for some food because farm supports (and quotas on some imports, such as sugar) distort markets. Much of U.S. agricultural policy is designed to protect the interests of a small number of large and wealthy producers. Laws originally passed to aid small farmers during the Depression now result in astonishing inequities and are often counterproductive. The Washington Post recently revealed that the federal government has paid at least $1.3 billion since 2000 to people who don't farm at all Â they simply happen to own property that was once used as a farm. Meanwhile, real farmers who rent cropland are being forced out of business by landowners who find it more profitable to use their property for other purposes while continuing to collect federal cash for crops they aren't growing. Ending these subsidies and lowering agricultural tariffs would boost the U.S. economy, eliminate waste and help farmers in the Third World trade their way out of poverty. It's a shame Washington thinks that its protectionist farm policies are something to be surrendered only grudgingly, and only if others do so. Good riddance, we say. 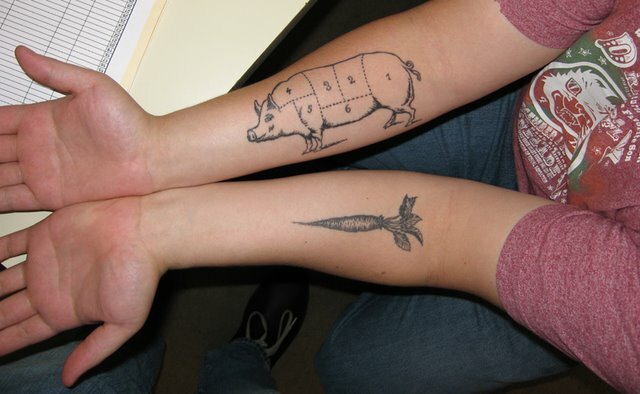 Aaron's tattoos posted at Alaina Browne's weblog a full belly hit dead center the visual message I could only distantly aim for in my side-bar photo, caught between my children's holiday gingerbread house and a piece of broccoli. If only I had the courage! Also at a full belly, see interesting coverage of the constructive latest round in the Pollan / Mackey debate about Whole Foods. This week in Long Beach, CA, the Food Safety and Nutrition section completed a fine pre-conference and still to come has a whole track of sessions on food safety and nutrition topics, in conjunction with the annual meeting of the American Agricultural Economics Association. See the section website for a list of the section's sessions and activities. The new issue of the journal Obesity offers my full perspective article comparing and contrasting the federal government's messages in the Dietary Guidelines for Americans and the generic commodity promotion or "checkoff" programs. When was the last time a computer-generated message brought tears to your eyes? Here is the eloquent robot prose I received in response to my email yesterday to a Lebanese friend and colleague who now teaches at the American University in Beirut. Temporary local problem. Please try later. Eventually we will give up, and when that happens, the message will be returned to you. I don't care what Revere or Majikthise say in their Sunday Sermonettes about my quaint traditions. In such times, my family and I pray for peace. Update. My friend and his wife and children are safely out of the country. He writes, "The situation is all so sad and surreal. Most AUB people I know have been evacuated. Many of those remaining behind are joining relief efforts.... I hope and pray that sanity prevails soon..."
The new issue of Choices Magazine, the American Agricultural Economics Association's flagship publication for non-economists, offers a special section on USDA's generic commodity promotion or "checkoff" programs. I have written previously for Choices about these controversial programs. Checkoff programs use the federal government's powers of taxation to collect hundreds of millions of dollars each year in mandatory assessments from producers, in order to fund well-known advertising campaigns, such as "Beef. It's what's for dinner," and "Pork. The other white meat." They have been roundly criticized in the nutrition half of the "nutrition economics" world (Laura Sims has called them “an anathema to most nutritionists and health professionals"). While the programs are treated more sympathetically by some agricultural economists, others have been critical. While the opponents of the beef advertising program had argued that the Operating Committee was a nongovernmental entity and, thus, the advertising cannot be considered government speech, the Court rejected this premise: "The message of the promotional campaigns is effectively controlled by the Federal Government itself. The message set out in the beef promotions is from beginning to end the message established by the Federal Government.... Congress and the Secretary have set out the overarching message and some of its elements, and they have left the development of the remaining details to an entity whose members are answerable to the Secretary.... Moreover, the record demonstrates that the Secretary exercises final approval authority over every word used in every promotional campaign" (125 S.Ct. 2055 at 2063 (2005)). Compounding that problem is the tendency of many checkoff program staffs and boards to oversell the actual and potential impacts of their programs to insure a positive outcome from producer referenda and otherwise justify continuation of their programs. Contributors come to expect large impacts on prices and profits because of the anecdotes they have been told about how successful various activities have been and how large the benefits to them are from contributing to the program. Estimated [benefit-cost ratios] much in excess of 1:1 often are taken to imply large absolute impacts of a checkoff program on the market. Nothing could be less true. A BCR of 5:1 results by dividing a $5 billion industry profit benefit by a $1 billion checkoff investment or by dividing a $5 benefit by a $1 investment. For most commodity promotion programs, the value of the expenditures in research and promotion activities is extremely small in comparison to the total value of industry sales. Commodity promotion expenditures generally amount to a fraction of 1% of the total industry sales each year. With such a low level of investment compared to sales, the overall impact of a commodity promotion program could hardly be expected to be significant in a practical sense in its effects on production, prices, sales, and market share even if the impact could be said to be statistically significant. When producers and other contributors fail to see the large impact on their returns that they have been led to expect, they tend to disbelieve the measured effectiveness of the checkoff program. In another article, Michael Wohlgenant reviews no fewer than six reasons why the actual benefit received by farmers might be different from the widely-touted benefit-cost ratios. Despite the amount of econometric research indicating high rates of return to generic advertising, there is disenchantment and disbelief among some producers and commodity groups as to whether producers actually benefit from generic advertising. More accurate measurement of the farm-level effects of retail-level generic advertising must account for various factors that influence the transmission of retail demand changes from advertising to the farm level. In the final article, Chanjin Chung, Bailey Norwood, and Clement Ward report results from a survey of Oklahoma beef producers. Of the 17% of producer respondents who were members of the National Cattlemen's Beef Association (see previous post), 63% were supportive of the beef checkoff program. Does that sound low? Wait, there's more. 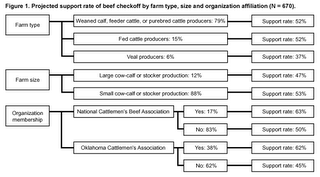 Of the much larger fraction of Oklahoma beef producers who were not members of NCBA, only 50% were supportive of the checkoff program. It is easy to see why several of the largest checkoff programs are trying to avoid producer referenda on the question of their continuation. Source: Chung, Norwood, and Ward (2006). Click for larger image. Washington Post: "No Drought Required for Federal Drought Aid"
John A. Johnson, deputy administrator for farm programs for the USDA, said that initially the program provided meaningful assistance to ranchers in areas suffering from drought. But after Congress loosened the rules, he acknowledged, "what was meant as disaster assistance ended up being given to people who didn't have a need or a loss." The National Cattlemen's Beef Association (NCBA) last week passed a resolution "seeking to push the U.S. military to require companies that supply troops in Iraq and other countries to buy beef processed in the United States," according to Brownfield Ag News. Currently, the troops in the Mideast are fed in part with food purchased from nearby countries. The cattlemen's proposal would require the armed forces to incur the additional expense of purchasing beef in the United States and shipping it across the globe. The cattlemen did not propose a source for the extra funding. Six Arguments for a Greener Diet, released today by the Center for Science in the Public Interest, brings together several themes from the non-profit group's portfolio of consumer communication and public policy advocacy. In it, the Center's Michael Jacobson summarizes the scientific case for a low-meat diet, on grounds of both environmental impact and public health: "Jacobson, who is not a vegetarian, says that the single most important dietary advice is to change your diet in a healthy vegetarian direction." The accompanying website, Eating Green, offers interactive features for assessing your diet or touring the modern system of factory-based agriculture. Jacobson and Nina Planck, farmers' market organizer and author of Real Food: What to Eat and Why, will be interviewed on National Public Radio's Diane Rehm Show this morning at 11:00 am. The Eat Local Challenge weblog got some extra attention last week, after the CNN appearance of folks from Locavores. It's not new, but I also recently revisited the nice interactive map graphic from Local Harvest at the FoodRoutes website. 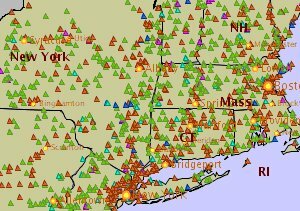 Here is the view when you zoom in on the region between my neighborhood and the Finger Lakes region of Central New York state, where a visitor in the coming week, if he or she happened to be on vacation, might enjoy the Grassroots Festival of Music and Dance. A feature-length product placement from Burger King? The recently revived Fast Food News weblog and Accidental Hedonist have links to a story about Burger King working on a feature-length movie where the setting is a Burger King outlet (at Accidental Hedonist, Kate Hopkins claims to be speechless). Product placement apparently isn't cutting it in the movie business anymore. Not satisfied, say, with a mere passing shot of a mega-star munching a Whopper, Burger King is developing a film whose main character lives above one of its burger franchises, according to a story in this week's Advertising Age, a trade magazine. No, it's not a horror film. And it's also not going to be what would seem the natural sequel to 2004's nutty teenage comedy "Harold & Kumar Go to White Castle." Instead, Burger King, along with ad agency Crispin Porter & Bogusky, which is overseeing the script, envision a "character-driven" story along the lines of "Garden State" and "What's Eating Gilbert Grape," according to Advertising Age. Do trade models answer policymakers' questions? The Subsidy Watch Newsletter this month offers an interesting debate between Frank Ackerman of the Global Development and the Environment Institute at Tufts and Will Martin of the World Bank about the elaborate economic trade models whose quantitative estimates form a center-piece of rhetorical debate over the current Doha round of multilateral trade negotiations. These negotiations, if they ever get out of their current doldrums, have major implications for U.S. agricultural and food policy. Beyond the debate, the best part of the newsletter is the robust set of links to explanations (.pdf), sharper criticism, and technical details of the economic trade models. Of all the sub-topics under U.S. food policy, U.S. fish policy may be the most confusing. Knowing what fish to provide your family requires balancing a host of health and environmental issues: omega-3 fats (good), methylmercury (bad), PCBs (bad), environmental consequences (bad), overfishing (bad), tasty low-fat protein sources (good). Marion Nestle's What to Eat, which I am now enjoying on my subway rides, takes no fewer than five chapters to lay out all the fish trade-offs and quandaries. On the constructive side, she describes the admirable recent effort to coordinate the message of several advocacy groups, which had previously published not-quite-consistent lists of better and worse fish options, reflecting the different weights the groups placed on various health and environmental issues. The resulting clear consumer advice is available from a site called The Fish List, sponsored by the Seafood Choices Alliance. Nestle encourages consumers to take this list to their fish counter, tell them that you will not buy anything from the "avoid" column, and ask them to press their suppliers to provide the "enjoy" options. Her chapter points out the insane passivity of the fish industry in response to the industrial pollution that causes the food safety problems that threaten the industry. That you cannot safely eat as much fish as you want from local waters in your state is a national scandal. Once you understand this situation, you cannot help but become angry about how such high levels of contaminants were allowed to get into your local streams and lakes and why so little is being done to stop the continued pollution of our national waterways. That, of course, brings us to the role of government. The government's lack of commitment to making fish healthier to eat can only be understood as responding to the political clout of industrial polluters and commercial seafood producers. Meanwhile, still on the topic of constructive efforts to address fish dilemmas, I enjoyed reading on Marginal Revolution this morning about the Nature Conservancy's recent success in buying up fishing permits and actual trawlers to help protect waters and fisheries off the California coast. Alex Tabarrok points out that the Conservancy "continues to pioneer innovative, market-based approaches to conservation." Have you seen this inspiring example of data visualization with a public purpose? It is a conference presentation by Hans Rosling. I first saw the link on BoingBoing a couple weeks ago. It includes links to Gapminder, the authors of a clever Flash animation that allows the viewer to choose variables and time periods, and then watch animated bubble plots that describe economic and demographic information about the world's countries. Hey, I wondered, why can't we do something fun like that for U.S. food policy? The following animation illustrates the effect of economic conditions and welfare reforms on the Food Stamp Program caseload in the 1990s. Because the Food Stamp Program is an entitlement, the federal government is somewhat at the mercy of factors beyond its control, which change the number of eligible people from one year to the next. Caseloads increased sharply in the early 1990s and declined even more sharply in the second half of the decade. In the heated debates that followed, some argued that the caseload fluctuations respond to economic conditions, while others placed the blame for caseload declines on the welfare reforms of 1996. The animation shows each state's Food Stamp Program participation level (as a fraction of the state population) on the vertical axis, and the state unemployment rate on the horizontal axis. The size of the bubbles in the plot reflects the state population, so you can distinguish major states from minor ones. Welfare reform occurred at different times in the various states -- the timing of the reform is indicated by a change in color from blue to red. You can see for yourself that the caseloads appear to respond in the expected way to rising unemployment in the early 1990s and falling unemployment in the late 1990s. Welfare reform does not have a visible effect on caseloads. Following a suggestion from the Center on Budget and Policy Priorities, Nader Kabbani and I did an analysis that suggested that comparatively obscure policies about food stamp recertification periods might be more influential than the welfare reforms illustrated in the animation. What is really cool is to see the diversity of state experiences with a clarity that a static graph could never achieve. The "start" button starts the animation, and the "pause" button stops it. To restart, hit the "start" button again. I plan to start using such animations in my teaching, and will post more of this sort of thing in the coming year. Comments and suggestions welcome. New York Times: High-fructose corn syrup gets "a bad rap"
Above all, do not read the headline of this New York Times article about high-fructose corn syrup. Do not read the sub-headings. Do not read the opening anecdote or the closing foolishness. These book-ends reflect the worst of "flavor-of-the-day" health and science journalism. In this brand of journalism, what you thought was unhealthy yesterday is always healthy today. And, for excitement and novelty, it will always be unhealthy again tomorrow. The spin of the headline and opening grabber paragraphs ruins an otherwise competent article. In the sensible body of the article, you will find that leading experts such as Barry Popkin and Walter Willett are very concerned about rapid increases in consumption of soda and other sweetened beverages in recent decades. These beverages rank with the switch from home cooking to fast-food diets and the adoption of sedentary lifestyles as leading causes of the obesity epidemic. Much of the sugar in these beverages, and scattered throughout the rest of the food supply in places you would never expect, comes from high-fructose corn syrup. In the sensible body of the article, you will find that this corn syrup should never be considered "natural." It comes from an industrial chemical process that cannot be reproduced in your kitchen. The headline is, "A sweetener with a bad rap." The "spin" of the article is that high-fructose corn syrup may be no worse than cane sugar in promoting obesity. That may be true, but it is like saying "cop-killer" bullets have gotten a bad rap, because it turns out that officers have been dying from regular bullets for generations, so everything you have heard about ammunition sales is wrong. High-fructose corn syrup contributes to obesity, and obesity is a serious health concern. If a different sweetener were mass-produced for the same products, then a different sweetener would be the problem. As it stands, without a doubt, the problem is high-fructose corn syrup. But now, after learning that many experts say the substance is handled no differently in the body than sugar, she says that she will probably let some products with high-fructose corn syrup slide. "I guess I don't need to be so hard-core about it," she said. It sounds like the reporter is telling everybody who will listen that experts consider high-fructose corn syrup to be harmless. It's not true, but Cabrera believed her. That's just tragic.